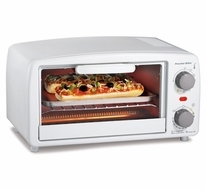 Toaster oven broiler.Extra-large interior easily fits 4 slices of toast or 2 personal pizzas. 15 Minute timer with automatic shutoff and ready bell. Includes bake pan and broil function. Handy broiler for cooking versatility. Drop-down crumb tray for easy cleanup.